The GearWrench teardrop ratchet set features 84 tooth gears that give a 4.3° swing arc for easy access. 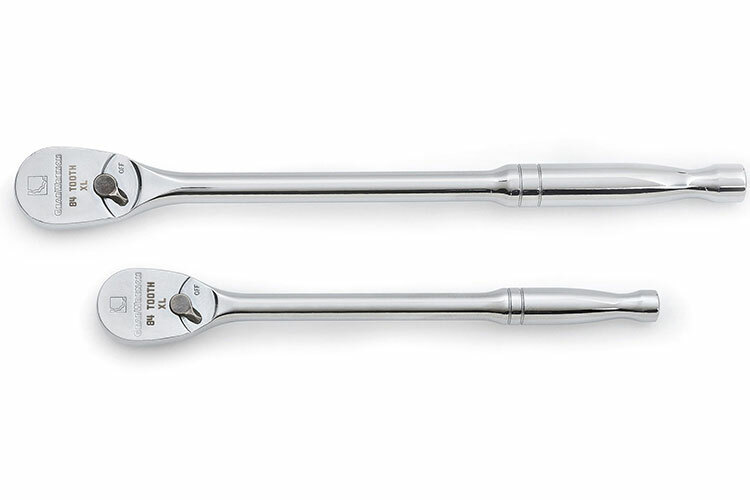 The GearWrench teardrop ratchet set also features a flush mounted on-off lever. GearWrench teardrop ratchets are coated in a full polish chrome finish. 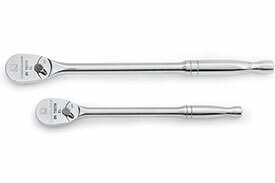 These GearWrench ratchets meet or exceed ASME B107.10. GearWrench 1/4'', 3/8'' and 1/2'' drive full polish flex handle ratchet 4 piece set. GearWrench 1/4'' and 3/8'' drive full polish flex handle ratchet 2 piece set. GearWrench 1/4'', 3/8'' and 1/2'' drive 120xp full polish flex handle ratchet 4 piece set. GearWrench 1/4'', 3/8'' and 1/2'' drive 120xp full polish ratchet 3 piece set. GearWrench 1/4'', 3/8'' and 1/2'' drive cushion grip teardrop ratchet 3 piece set. GearWrench 1/4'' and 3/8'' drive cushion grip teardrop ratchet 3 piece set. GearWrench 1/4'' and 3/8'' drive cushion grip flex teardrop ratchet 2 piece set. GearWrench 1/4'' and 3/8'' drive 120XP cushion grip flex teardrop ratchet 2 piece set. GearWrench 1/4'' and 3/8'' drive thumbwheel ratchet 2 piece set. GearWrench 1/4'' and 3/8'' drive 120XP cushion grip roto ratchet 2 piece set. GearWrench 1/4'', 3/8'' and 1/2'' drive quick release teardrop ratchet 3 piece set. GearWrench 1/4'', 3/8'' and 1/2'' drive full polish teardrop ratchet 3 piece set. The 81268 GearWrench 1/4'', 3/8'' and 1/2'' Drive Full Polish Teardrop Ratchet 2 Piece Set is one of thousands of quality tooling products available from MRO Tools. Please browse GearWrench Multidrive Ratchet Sets for tools similar to the 81268 GearWrench 1/4'', 3/8'' and 1/2'' Drive Full Polish Teardrop Ratchet 2 Piece Set. 81268 GearWrench 1/4'', 3/8'' and 1/2'' Drive Full Polish Teardrop Ratchet 2 Piece Set description summary: GearWrench 1/4'', 3/8'' and 1/2'' drive full polish teardrop ratchet 2 piece set. Quantity discounts may be available for the 81268 GearWrench 1/4'', 3/8'' and 1/2'' Drive Full Polish Teardrop Ratchet 2 Piece Set. Please contact MRO Tools for details.